Having established a new direction with the DS3, Citroen are attempting to expand the range further by introducing another DS model with the DS4. The exciting exterior and interior design, sharp dynamics and numerous personalisation options all contributed to the DS3's success, and Citroen are taking a similar path with the bigger DS4. 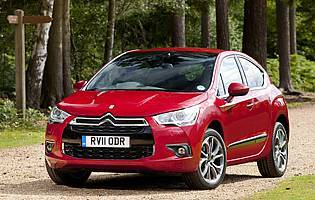 As with the DS3, the DS4 starts with another Citroen model as a base - in this instance the C4 hatchback - and attempts to tread new ground. The manufacturer claims the DS4 is a four-door coupe, with hidden rear doors and a more curvaceous body. It certainly stands apart from the C4 hatchback, but whether it is attractive or not is entirely down to personal taste. It is certainly a car that is sensitive to colour and trim combinations. Another important element of the DS4's design is the higher than normal ride height. An unusual combination with the four-door coupe theme is a semi-SUV stance, the intention being to give the driver and passengers the slightly raised view out that can be a big influence on buying decisions. In this respect the DS4 could almost be called a crossover, but it is important to mention that it is strictly front-wheel drive only. In all other respects the DS4 is mechanically conventional, with a wide choice of petrol and diesel engine options with transmission options to suit. It does however have unique chassis tuning compared to the C4, as Citroen claims that it offers a similarly sharp driving experience to go with the exciting appearance. Close attention has also been paid to the interior, and the intention is to provide a premium feel with a unique design. Elements such as the 'watch-strap' design leather seats and customisable audio and lighting effects go a long way to providing a high quality feel. There are also many personalisation options, something which has proved to be a key part of the DS3's success. Spinning off a more unusual model from an existing car made perfect sense and resulted in a sales success with the DS3. The DS4 attempts to carve a more unusual niche, and aside from the divisive looks it is hard to see where it offers any significant edge. Very competent and well-specified it may be, but the DS4 struggles to justify its existence. 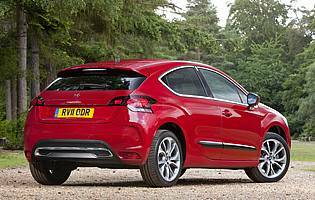 Thanks to the impressive engine range the DS4 should be quite a cheap car to insure, tax and fuel. Even the petrol options are fuel-efficient and are a welcome alternative for those not keen on diesel. Undoubtedly the DS4 has decent space for front and rear seat occupants, and the boot is on the large side for a class of this car with additional useful underfloor storage included. There are also useful cubby spaces inside the cabin. Despite the more fancy dressing the cabin of the DS4 has a typical Citroen feel, with a slightly unusual take in terms of instrument design and displays. For the most part it works well and is attractive, and the customisable elements are a novel and appealing feature. The main display screen however is a little fiddly to use, and quite often it is hard to fathom the correct button. 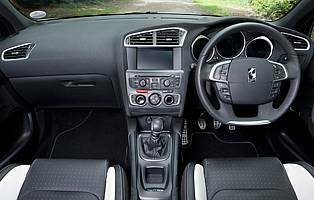 The DS4 does offer a good level of comfort, helped by the decent ride but also the attention paid to sound proofing resulting in a well-insulated cabin environment. Refined engines are a great help in this area too. An alarm and immobiliser is fitted as standard to all versions of the DS4, and locking bolts on the wheels are welcome given the attractive nature of their design. All versions of the DS4 are packed with safety equipment and crash tests have achieved impressive results. The only additional equipment included in higher specification versions is the Emergency and Assistance System which dials a call centre in the event of an emergency. For the driver the additional height of the seat is certainly an advantage, and the driving position is very good. The response of the high-output diesel is impressive, making short work of town driving and accelerating with ease when out on the open road. The gearshift is relatively slick and the pedal actions are consistent. There is a good balance between ride and handling but it is neither sporty nor comfort-oriented, so is best suited for those wanting a compromise. Considering the number of inoffensive verging on dull cars that are suitable for families, the DS4 does at least offer something a little different for the whole family. Children sitting in the back may get fed up of poking themselves with the pointed end of the doors however. With the highly-desirable and accessible DS3 in the portfolio it seems unlikely that new drivers will be attracted to the larger and more expensive DS4 instead. Although Citroen are aiming for a premium feel, at this price point it is best described as semi-premium as not every surface matches up to the high standards set by others. However it is of good quality nonetheless, and the cabin is a pleasure to be in. The DS4's image is a little more difficult to pin down, as it may gain a little halo effect from the DS3 but its design will be make or break for potential customers. The DS4 is something of a mixed bag in this respect. Front seat occupants have conventional doors and the highest point of the roofline which makes entry straightforward, but the rear is a little different. The hidden door handles may need to be pointed out to the uninitiated, and the shape of the door and its aperture make entry and exit a little more difficult than they should be for a car of this size. The extreme rear edge of the door is quite pointed and is easy to catch yourself on, which is a significant negative point. All versions have a six-speaker radio/CD unit and auxiliary connection. DStyle models and above also have a USB connector and Bluetooth. 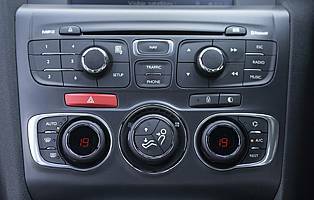 Sounds quality is impressive and the column-mounted controls are useful, particularly as the main controls on the dashboard can be confusing. Giving buyers a wide choice is part of the DS4's appeal, and the unusual shape looks much better in more radical metallics than plain block colours. The same goes for the cabin, where the Habana leather option brings the attractive 'watch-bracelet' detailing and the at least semi-premium feel is appealing. Concessions to style mean the DS4 doesn't have quite the same all-round visibility of its C4 sibling, but the higher seating position at least gives some advantage. Rear parking sensors are optional on DSign and standard on DStyle and above, while front parking sensors with a parking gap measurement system are only standard on the top DSport models. Emergency tyre repair kit as standard with option of full size or space saver spare. Petrol engine options - 1.6-litre (118bhp, 154bhp and 197bhp). Diesel engine options - 1.6-litre (110bhp); 2.0-litre (161bhp). Transmission options: Five-speed manual on low output petrol, six-speed manual or six-speed automated manual on all other models. Trim levels: Dsign, DStyle and DSport.